ArabSaga: Syria crisis: "Try Russia’s ambassadors next"
France, Canada, Japan, the United States, the United Kingdom, Australia, Germany, Italy, Spain, Bulgaria, Turkey and the Netherlands have all expelled Syrian ambassadors and diplomats this week over the Syrian regime’s May 25 Houla massacre. The expulsions mean nothing to Damascus, says columnist Rajeh al-Khoury, writing Thursday for the independent Lebanese daily an-Nahar. Muallem later erased the Arab League and Gulf countries from the Arab map as well, Khoury remarks. Effectively, Khoury writes, the Syrian president sent Annan packing -- to Lebanon and Jordan, for instance. Notwithstanding the Houla massacre perpetrated by regime forces and documented by UN peacekeeping chief Herve Ladsous, or the global expulsions of Syrian diplomats, Russia is still blocking UN Security Council measures or sanctions against Syria. Political analyst Rosanna Boumounsef, who also writes a daily column for an-Nahar, today says the Houla massacre greatly embarrassed the Russians. They had no choice but to halfheartedly go along with the Security Council press statement blaming the Syrian government for attacking residential areas of Houla with artillery and tank shelling and also condemned the close-range killings of civilians there. Boumounsef says all eyes will now focus on Russian President Vladimir Putin’s meetings with German Chancellor Angela Merkel in Berlin and French President Francois Hollande in Paris this week and U.S. President Barak Obama at the G20 summit in Mexico in June. 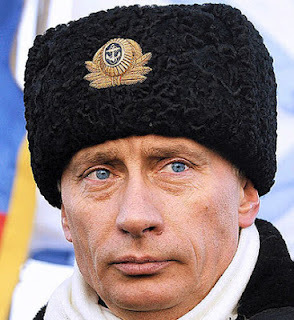 All three Western leaders will surely be trying to shift Putin’s stance on Syria. But what are the chances of them succeeding? Konstantin von Eggert, a commentator and host for Russia's first 24-hour radio news station Kommersant FM who was diplomatic correspondent for Izvestia and later the BBC Russian Service Moscow Bureau Editor, ponders those chances in his new weekly column for RIA Novosti. Moscow did not protest, but rather joined in signing the UN Security Council statement condemning the massacre of civilians in the Syrian town of Houla. Russia’s Minister of Foreign Affairs Sergei Lavrov told his British counterpart William Hague that the survival of the Assad regime is not as important as stopping the violence in Syria. But has there really been a change of heart? For now, the evidence is pretty slim. Official Moscow still blames both the opposition and the government forces for the bloodshed, while simultaneously actively peddling the Syrian regime’s propaganda line that it is at war with “foreign-sponsored terrorists.” Russian diplomats hint that Saudi Arabia and Qatar are supplying arms and money to the rebels. Rumors that yet another freighted ship, loaded with Russian arms, was heading toward the Syrian coast surfaced as recently as last week. Still other reports indicate that there was a sharp fall in Russian diesel fuel supplies to Damascus. The signals are contradictory at best. It is clear, though, that the essence of Russian policy toward Syria remains the same: no regime change. In this respect, the Russian line is dictated even more by Vladimir Putin’s deeply held conviction that the West is out to get all the regimes it considers to be unfriendly than by his wish to protect Russia’s interests in Syria – mostly the naval station in the port of Tartus and contracts to supply arms to Bashar al-Assad’s regime. Not that the latter are completely unimportant, but it seems that the Russian president uses the Syrian example to prove that Russia will never allow anyone, including the UN, to decide who is going to rule which country. The Kremlin’s deeply held view of sovereignty as an unlimited right for political regimes to do as they please inside their states is one of the cornerstones of Russian foreign policy, and it has been especially dominant since the war in Libya. Putin feels that the West duped Russia into de facto sanctioning international intervention in Libya, and seemingly vowed never to let it happen again. This may be a vow he will not be able to keep. As the violence escalates in Syria, and as the Syrian dictator shows no sign of abandoning his methods, Russia’s favorite approach to crisis resolution looks ever less likely to succeed. Moscow would have liked to be among the several mediators ensuring a Yemeni-style easing of Assad out of the presidential chair and replacing him with one of the less notorious regime figures. This was the solution in Yemen, where President Ali Abdullah Saleh was given a ticket to honorable retirement after 34 years in the presidential palace in Sanaa. His vice president succeeded him. But the intensity of civil war in Yemen is incomparable to what goes on in Syria. In this poor Arabian state the armed forces effectively split, prompting the sheikhs and the politicians to sit at the negotiating table in order to avoid a civil war 50 years down the line. Not so in Syria, where, supported by Moscow and Beijing, the Assad clan thinks it can ultimately suppress the opposition and appease the country, although at a high cost. Western countries, reluctant as they are to apply a military solution, may be left with nothing to do but use some kind of military measures against the Assad regime. Most of the other means of applying pressure have already been used to no avail. It may have seemed impossible just a month ago, but today it looks increasingly likely that a new “coalition of the willing” may well be cobbled together in order to put an end to the bloodshed. To say that this would be a risky endeavor is to say nothing. However, ultimately there is little doubt that the Syrian army will be no match even against a coalition of second-tier NATO allies. The Kremlin will never sanction a Security Council resolution authorizing the use of force. But, as a senior Russian diplomat told me a few weeks ago, “If the West wants to burden itself with Syria, well, we cannot prevent it from doing so. But the Western countries will then be wholly responsible for the outcome.” The United States and the EU seem to be nudging closer to the notion that they have to be true to their own values to stay in the Middle Eastern game. Moscow can afford to step aside. However, Moscow will still have to be prepared to pay a serious price in whatever remains of its prestige in the region.